Edward Douglass White, ninth chief justice of the U.S. Supreme Court, is known for his enunciation of the "rule of reason" for interpreting and applying antitrust legislation. Born on Nov. 3, 1845, at the family plantation at Thibodaux, La., Edward Douglass White was the son of a lawyer and sugar planter. A Roman Catholic, White was educated mainly by Jesuits. He was attending Georgetown College when the Civil War began; he returned to Louisiana and fought in the Confederate Army. After the war he studied law at what became Tulane University and was admitted to the bar in 1868. A conservative Democrat identified with the overthrow of the Radical Reconstruction government, White was named to the Louisiana Supreme Court in 1878. When his faction of the party lost power, he returned to a lucrative private practice; when it regained influence, he was elected to the U.S. Senate in 1891. Save on the lowering of sugar tariffs, which was detrimental to Louisiana, White was loyal to President Grover Cleveland, who appointed him to the U.S. Supreme Court in 1894. White refused the appointment until after modifications favorable to Louisiana were made in the tariff reform bill. A hardworking but not innovative justice, White fitted comfortably into a Court committed to encouraging business as the best insurance of national prosperity and stability. He broke from this pattern to dissent in Pollock v. Farmers' Loan and Trust Co. (1895), which held an income tax to be unconstitutional, and, he voted with the minority in Lochner v. New York (1905), which disallowed a state's regulation of the length of working hours of bakers. White also wrote a significant concurrence in one of the Insular cases, Downes v. Bidwell (1901), which required explicit congressional action if constitutional privileges of American citizens were to extend to persons in the nation's newly acquired overseas territories. During White's 27 years on the Court, justices Stephen Field, John Marshall Harlan, Oliver Wendell Holmes, Charles Evans Hughes, and Louis Brandeis all overshadowed him. 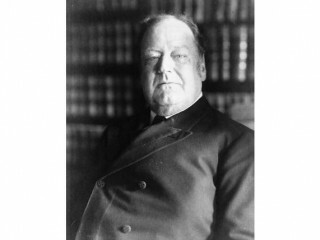 White was appointed chief justice in 1910 largely because of the ambition of President William Howard Taft, who hoped that, by appointing a man of 65, he himself could succeed him. White did not lead the Court into bold new areas of judicial thought; he prescribed, instead, the "rule of reason." Undercutting antimonopoly efforts, White's Court appealed to the common law to allow "reasonable" restraint of trade in Standard Oil Co. v. U.S. (1911) and U.S. v. American Tobacco (1911). Thus White was reflecting the pragmatic spirit of the day and, from a viewpoint favorable to business, testing whether a business combination was workable rather than whether it complied with the letter of the law. On May 19, 1921, White died in Washington. With a Republican back in the White House, former president Taft made good his ambition: he was named chief justice. View the full website biography of Edward Douglass White.